Equi-Heart Pledge: Day 28 Equine Insight into the Law of Attraction! Today, I expanded my horizons and tried something we don't usually do at the ranch, riding one horse, while ponying another (a good way to get fitness on 2 horses at once!). Needless to say, because we were new at it, we weren't perfect...which gave me a perfect opportunity to practice an age-old Law of Attraction principle. According to Law of Attraction principles, what we focus on expands. Primarily because whatever energy we send out, we attract more of. So by focusing on what is good, by celebrating whatever was right...we are then in the feeling-space of creating more of that which we enjoy, rather than of what we don't want- which tends to happen when we focus on what we don't like. Trouble is, most humans don't have that habit! We are actually hard-wired to focus on what's wrong- as a means of survival, I suppose, which was useful way back when we were being chased by saber-tooth tigers and needed to hunt & gather for food. But it's not so useful anymore- it just a plain downer! So join me today in celebrating what was good in your day. What went right? Focus on appreciation for that and by doing so, we'll invite more things to feel good about! This is exponentially more true when we add another being into the loop! If I focus on appreciating Frolic for what she did right today, rather than scolding her on what she did wrong- what do you think will be the result?! It's the same for everyone in our lives- co-workers, friends, kids, spouse- so go focus on something they did right today and let them know. Create a circle of goodness- wherever you look! Here's some more sage wisdom from Seren about how to transform every moment by savoring what really matters- love! Blog post- Do You Have an Embracing Heart? We're getting close to the end of our 30 day Heart Experiment with Horse!!! Do you have a heart-touching moment or lesson from the herd you want to share? 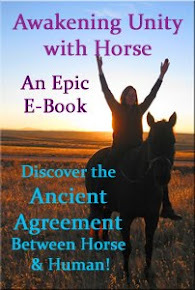 Please email me a post at drjenn@unitywithhorse.com and we'll share it here and on our book blog of Dorothy Moments- times when Horse transported you to a whole new world of possibility! 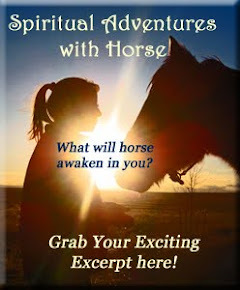 Help uplift others with your experiences of the Heart of Horse!! !